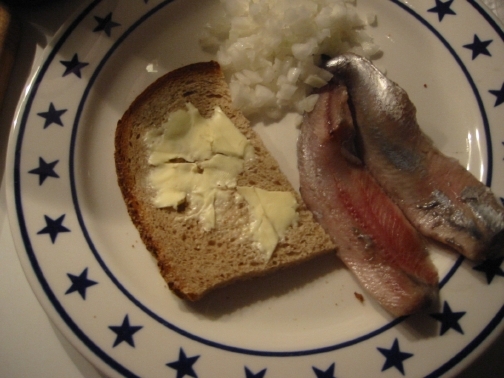 It’s Dutch nieuwe haring season, raw fillets of herring from the first catches of the season. I guess you’re supposed to drag it through the raw onions and then dip it into your mouth holding it by the tail, but I preferred it the way I got it at various shacks around Amsterdam: on bread and butter with the raw onions on top. It’s meltingly delicious, and does not shy away from being raw fish. This is not sushi. It’s very robust. Fantastic with beer, probably even better with vodka or champagne. For those of you in New York, Russ & Daughters still has it, flown in fresh from Holland. Get it now – it won’t last long. actually, you’re supposed to eat them without the onions. that is, if the herring is fresh enough. the onions were originally used to ‘mask’ the taste when the herring, you know, had gone a bit off. It’s been said that they are exceptionally good this year, but it may just be a publicity stunt. Most foreigners (and some Dutch people too) find it disgusting to watch people eat them let alone to try one for themselves. But I like them once in a while. Glad to hear you like them too. Some other site also suggests white wine like Muscadet or Chablis. do you know what Jenever is? That’s the more traditional drink.